Hassan city is the district headquarters of Hassan district in the Indian state of Karnataka. The town is situated 935m above sea level and generally witness dry season. City is best known for its Ginger and Coconut markets. Also, agriculture in the area is considered to be very good, thereby city receives major demand for heavy and mediumcommercial vehicles (H&MCV), agricultural equipment as e-commerce is the main work force in the area. Shriram Automall India Limited (SAMIL) being India’s Most Trusted Platform for Exchange of Used Vehicles and Equipment in an Organized & Transparent Manner, understands the demand and thereby while anticipating the requirement of people in and nearby areas is coming with its 73rd Automall facility in the district. The Automall will be inaugurated by Mr. Umesh G. Revankar, MD-STFC and Mr. Sameer Malhotra CEO SAMIL. Turning out to be a privilege Hassan is connected by road via national highway No. 75 to the rest of the country, keeping that in mind SAMIL has very strategically located its Automall facility at the Bangalore-Mangalore highway Vill Eachalahalli, Post Kandali, Hassan, Karnataka – 573217, so that every requirement in and nearby areas could be fulfilled through the most innovative and optimal bidding platforms in the country. Over the years SAMIL’s biddingevents have become industry’s most talked about innovation. There is nothing more exciting than attending company’s bidding events to acquire or dispose desired used vehicles and equipment, as company gains a leading edge over its competitors for implementing, the most extensive line up of Used Vehicles and Equipments of all make & models with dedicated team for each segment. Company can majorly anticipate demand from the customers residing in Chikmagalur, Sakleshpur, Tiptur, Arsikere & Channarayapatna. 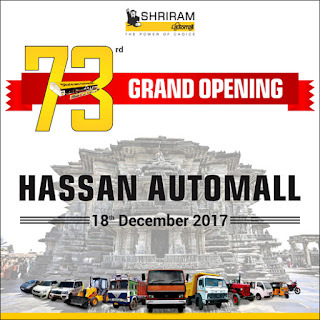 Adding, Hassan is 183 kilometers west of Bangalore, 119 kilometers north of Mysore, and 171 kilometers east of Mangalore by road, so potential customers in these areas can also visit the Hassan Automall to acquire or dispose used vehicles and equipment on any and every make and model. 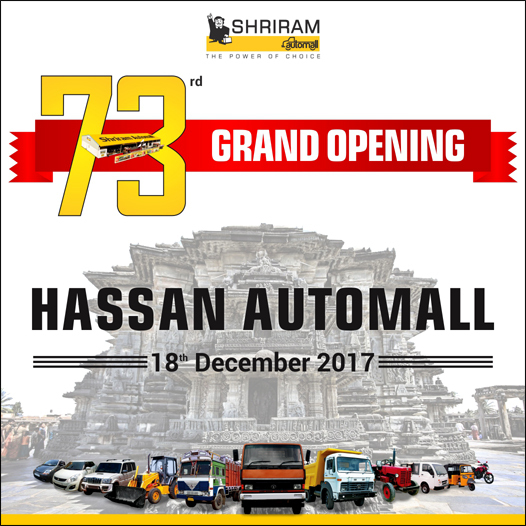 If you are an interested buyer or a seller of a used automotive or equipment, Shriram Automall (Hassan) is going to be a trusted name for optimal and convenient transactions just like its other 72 Automalls and 150+ bidding locations. Visit the Hassan Automall, on 18th December’2017 (Inauguration Day), and participate in the special bidding event to take home desired used vehicle of your choice.